Sorry pinnypinny that wasn’t “Sam” (1966 World contest was). When you mentioned Nat at Honolua Bay in the Hot Generation, I could see Nat it my mind carving that vee bottom in relatively large waves. Finally the vee bottom got some credit. Before that, with McTavish spinning out at Sunset, most folk thought the Vee’s where a joke. My opinion, Nat could probably ride an oversized plastic fast food serving tray! The film of Nat’s rides on that day were viewed at the local High schools and most all of us sat there mouths a gasp. If you didn’t have one (Vee) you soon would. After seeing the fixed snap on that board I quickly sold my 7’-11” stringless and with the cash made a reverse tee ban 6’-6” with a big old greenough fin. Rode it to its death overhead + to knee knockers. I could go on about what else Mr. Young did for us, that’s another story. I forgot to mention Neal Purchase and please forgive me. Like I said, in researching vee bottoms (I plan on making a replica as most the old vees just got trashed). But Neal’s “Virgin” is the example that is the closest as a period piece in my mind. Enjoy the photos! Thanks Nat, Bob, Neal and George. His operation was initially based under the Manhattan Beach Pier, but by 1949 he had outgrown it. And from his belly we sprang forth. 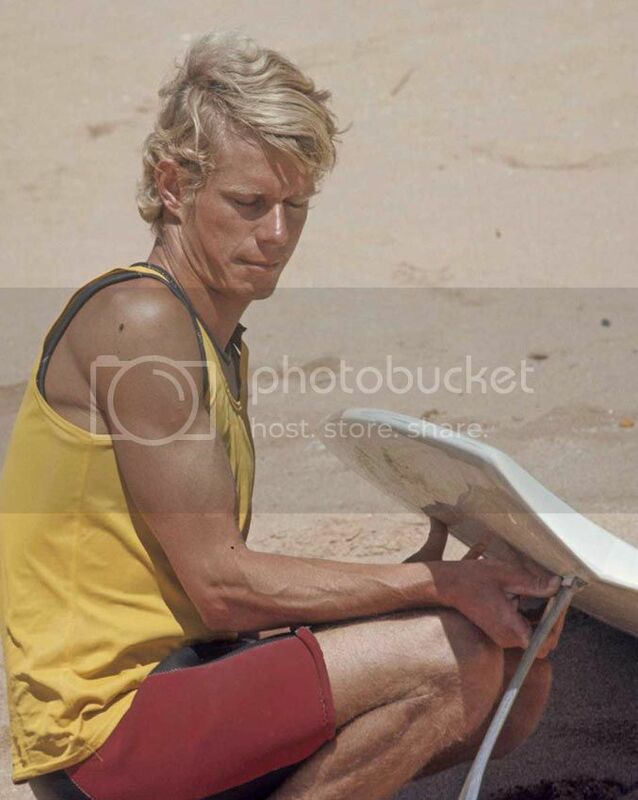 NP is the quite achiever of Aus surfing.....still a regular in the line-up , and only retired from shaping a little while back......not hard to see the influence in the shapes of his son Neil Jnr. Leave Bernard out of this. That was the "a look into the past ####" post. Unless your saying Midget had something to do with "Sam" (1966 World Champs board). Hey I'm new to this forum and it looked like I might have opened a wound. Was there some crap before? The last thing I would allow is Mr. Farrley being batted about. No tension mate. BTW, why don’t we change up and go with vees’ as Sam’s going nowhere! Enjoy the photo. I dig the history of the vee and the whole scene at that time. Yeah "Sam" is more like Elvis these days! I don't think it was a"hull", just that it had a rounded bottom. I have a pretty modern longboard that has a rounded bottom, and what I would describe as 50/50 rails through the middle, but it isn't what I'd consider a hull. Works very well btw!. Love the pig outline, the Sam looks like fun! !